A sweet almondy topping in place of pastry gives a new twist to homemade mince pies — why not make a batch or two? 1. For the pastry, place the flour and ground almonds in a large bowl, add the butter, icing sugar and orange zest and gently work together with your hands until the mixture resembles rough breadcrumbs. Stir in the egg yolk then turn out onto a clean work surface. Knead gently until you have a soft, smooth ball of pastry (add a little cold water if needed) then wrap in clingfilm and chill for 1 hour. 2. Meanwhile, stir together the mincemeat and cranberries in a small bowl. 3. Unwrap the pastry and roll out on a lightly floured work surface to the thickness of a £1 coin. Using a 9cm round cutter, cut out 12 discs of pastry and press into the holes of a deep tartlet or muffin tin. Fill each pastry case with the mincemeat mixture then return the tray to the fridge for 30 minutes. 4. Preheat the oven to 180°C, gas mark 4. Whisk the butter and sugar together for 3-4 minutes until pale and fluffy. Gradually beat in the egg and almond extract then fold in the ground almonds and flour. 5. Spoon the frangipane mixture over the top of the mincemeat, scatter over the flaked almonds then bake the pies for 25–30 minutes until golden brown. 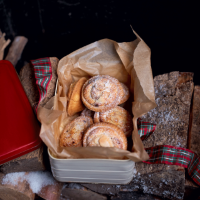 Cool in the tin for 10 minutes then turn the mince pies out onto a wire rack. Dust with icing sugar to serve. COOK'S TIPWarm gently in the oven before serving.